As a community organizer, it’s often difficult to remove the socio-critical lens through which I view the world, its problems and their potential solutions. With our Good Food Community Fair themed “Back to the Land” right around the corner, I’ve been thinking a lot about how the ideals behind such a phrase translate across various contexts. I talk a little about overcoming the cognitive dissonance as a black woman volunteering on an organic farm here and have since broadened my inquiry to include those who cultivate diverse meanings within the larger agrarian movement. For many San Diegans, this can look similar to the “Back to the Land” movement of the ‘60s: engagements with several of the bustling community gardens around the city or any of the more than 6,600 farms peppered throughout San Diego county--more than any other county in the United States. (Howard Lipin, San Diego Union-Tribune). Though an avenue to self-sustenance along with reconnecting to culture and a way of life involuntarily left behind, this project’s brevity reflects the struggles growers and organizers still face, despite the growing public interest in initiatives around civic ecology. Looking deeper highlights the importance of regenerative agricultural practices, such as those of the Kumeyaay Nation. They are stewards for preserving native food heritage and also guardians of the narratives about fostering mutually beneficial relationships with Mother Earth. The visions inspired by Indigenous Regeneration projects remind us of the positive impacts of simple, intentional concepts like habitat restoration, sustainable living techniques and recycling for empowering our communities. In an era of environmental degradation, it is honoring the traditions of those most harmoniously coexisting with the land that will facilitate the rebirth of the biodiversity truly making the greater San Diego region a haven for all life. When we talk about going back to the land, it is essential to acknowledge that for some it is a choice offering nourishment and respite from urban activity and for others it is an overdue return to what was stripped or taken away. When we speak about giving back to the land and acting accordingly, we’re not only feeding the world. We’re preserving and institutionalizing the traditional ecological knowledge for recreating a planet that is good, clean and fair for all. 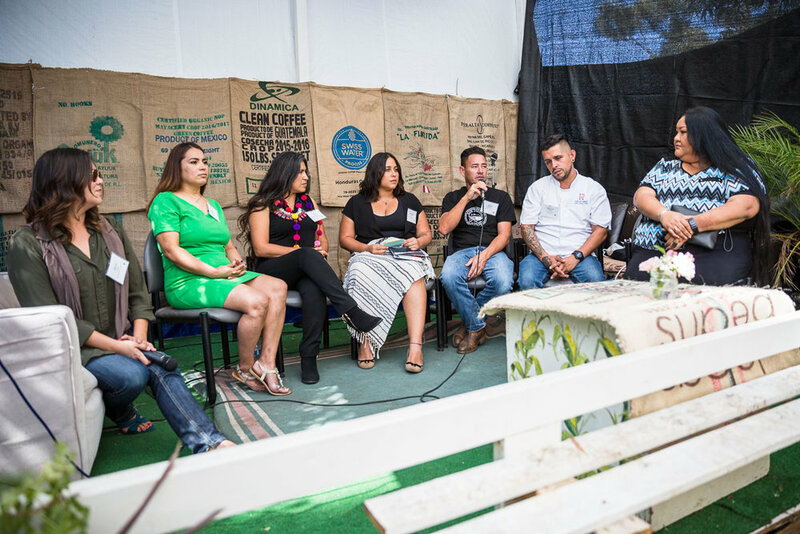 To learn more about the ways in which our communities can work toward a better food system in and around San Diego, join Slow Food for our Fifth Annual Good Food Community Fair Saturday, October 6th, 2018, from 11:00 AM – 4:00 PM PDT at the WorldBeat Cultural Center. We will be bringing attention to the consequences of industrialized agricultural practices and discuss how regeneration can guide the revival of our ecosystem while celebrating the ways in which we can give back to the land and manifest abundance.